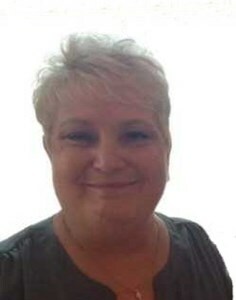 Donna Jean (Conover) Hash, 63, of Lexington, Indiana, passed away on Thursday, February 7, 2019. She was a lover of animals and enjoyed shopping. Donna worked for many years as a manager at the Long John Silver’s in Madison, Indiana. She attended the Lexington Presbyterian Church. Donna was a devoted mother and cherished any moment spent with her grandchildren. She was born on August 10, 1955, in Madison, Indiana, to the late William “Billy Bob” Conover and Wilma (Means) Conover. Along with her parents, she was preceded in death by her wife of 19 years, Sandra Lee Hash; sister, Cheryl Conover; and grandson, AJ Brendle. Donna is survived by her sons, John Harlow (Tom), Kevin Marshall (Karen), and Jerry Marshall (Courtney); siblings, Carolyn Gibson, Mike Conover (Vickie), Janice Spillman (Dale), and Lloyd “Johnny” Conover (Debbie); grandchildren, Kison, Tryce, Vanessa, Kelli, Jacob, Jesse, Peighton, Tayler, and Charlea; great-grandchildren, Wyatt, Maddie, and Clayton; and numerous nieces, nephews, and friends. Cremation was chosen following Donna’s wishes. A Memorial Gathering will be from 4:00 p.m. to 6:00 p.m. on Friday, February 15, 2019, at Lexington Presbyterian Church (2814 South Mulberry Street, Lexington, Indiana). Her Celebration of Life Service will follow at 6:00 p.m. at the church. Newcomer Cremations, Funerals & Receptions (3309 Ballard Lane, New Albany) was entrusted with her care. Donna had a love for animals, in particular cats. The family requests that contributions in her memory be made to the Humane Society of Scott County (P.O. Box 711, Scottsburg, IN 47170). Please consider sharing a memory of Donna or leaving a special message by clicking the "Share Memories" button above. Add your memories to the guest book of Donna Hash. I am so sorry for the loss of your Mother. She must have been a wonderful woman to have raised such a loving, caring man as yourself. My thoughts and prayers are with you and your family. I met Donna Jean just before we started first grade. Her grandparents lived on the corner across from our farm and just a short walk from my childhood home. We walked that short distance a lot during our younger days. We stayed close friends for many years. She and her first husband were with us when I eloped with my first husband. Lots of memories throughout our growing up years that we remembered when we found each other on Facebook. R.I.P. my oldest friend. She will be missed. She would always make us laugh. She told us to honk when we went by her house and we did. All our love and prayers. Donna would always tell me and jesse to becarefull riding those four wheelers. She always put us to work. she alway new how to make the people around her smile. She was like my second grandmother.always treated me like family well the whole family treated me like i was family. I hope every thing gets better for you all ..just gotta be strong if you all ever need me ill do the best i can. Love you all..
Donna has been my friend from the first time I was old enough to have memories. Her dad and mine were friends . She was at my house and we played under the tree the day they came to get my dad from the house when he died. We rode the bus together and when we both had families, she and I would put my 2 boys and her 3 in her volkswagen to go shopping. She was a pretty lady who loved life and had a big heart. I have many, many memories of Donna Jean when we were children, 8 years old! I remember us all playing in the woods from early morning, running through creeks, climbing trees, going through cow pastures, until Aunt Wilma would call us in for dinner! I could always here her calling us as I was hungry!!! Donna Jean was one tough cookie and gave us a run for our money out there! I especially remember her wearing her heart on her sleeve! One of my most recent and favorite memories was that me, Brittany, and grandma Donna would walk around the house and Donna would say “I’m in a futsin possy” and she would point her fingers like they were a gun and say it agin. Then she would grab the water bottle and squirt me with it and she would just be having a blast at doing it. And another was anytime I would drive her around we would jam out to some hip hop or anything that had a fun beat to nod our head to or sing together. I have fond memories of Donna Jean going back to when we were in kindergarten. Aunt Wilma had a little folding table for Donna and the other kids. We sat one Valentines Day at that table and made Valentines for everyone. When we were about 18, I visited and Donna was driving the family car, perhaps hers, and she saw a large turtle crossing the road by Grandpa Means’ house. She backed up, wrapped this huge turtle in a blanket that was in the trunk of the car, and took it home to put in the pond. She wasn’t a bit afraid of this snapping turtle, and I told her I’m not touching that thing! She just giggled saying it probably wouldn’t bite her hard. Such a lovely person! Donna always gave me a hug and we had great conversations! I will miss see her. John, you are in my thoughts and prayers, as is Tom and the kids. Let me know if there is anything you need. Love you guys!